If you haven't heard of the Kalki Moon Distilling & Brewing Company than it's time for you to pour yourself a gin and tonic and get educated. Taking the Australian gin game to the next level this Bundaberg-based, family-owned business has only just celebrated its first birthday and already is dominating spirit competitions around the nation. Founded by Rick Prosser, a veteran of the alcohol industry with 18 years under his belt, this boutique, small batch distillery focuses on quality over quantity using premium local ingredients from the molasses of their rum to the key botanicals in all their Gin including lemon myrtle, cinnamon myrtle, ginger and native finger limes and, boy, does it show. Kalki Moon saw themselves centre stage in the competitive world of Australian spirits when their Premium Gin took out the gold medal in March 2018 at the Australian Distilled Spirits Competition in Melbourne. 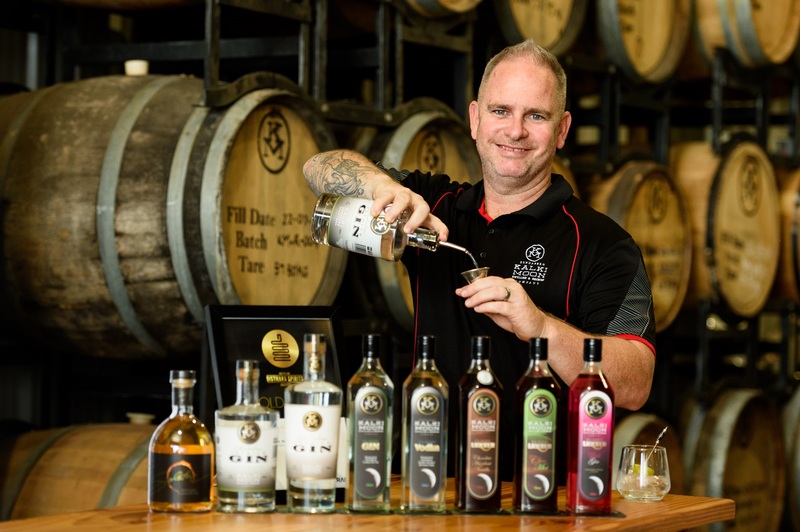 Whilst all entered products took out awards at this competition their gold medal saw them as the first Queensland Distillery to take out the prize since the competition began. Despite the countless awards and accolades what Rick is most proud about is having taken all the risk, challenges and reaping the rewards as a family. Rick, his wife Kylie, his mum Dianne, his in-laws Shane and Annette, and his three kids Josephine, Jye and Chloe all help run the business. Like most small businesses, juggling the hours in the day, an ever-growing business and quality family time is one of Rick's biggest challenges and learning curves. With plans for expansions and no chance of slowing down Kalki Moon will continue to grow their product and grow Bundaberg as a premium destination for spirits alongside a supportive community of master blenders and craft brewers and with a loving, supportive family. Where Can I Find Kalki Moon this Winterfeast? Come craft an exclusive gin this Winterfeast at Kalki Moon's intimate event Let the Night Be Gin which includes a guided group distilling masterclass, 2 x cocktails, a three-course meal and a bottle of made-on-the-night one-of-a-kind gin. Where Can I Buy/Try Kalki Moon Products? Come for a free tour and tasting at the Kalki Moon Distillery Cellar Door or grab a glass at The East End Hotel, Kellys Beach Resort Restaurant, Water St Kitchen, Indulge Café, The Spotted Dog Tavern, Riverfeast and Bargara Brewing Company. You can purchase your own bottle (or two!) of goodness at the Distillery Cellar Door, Bourbong St Cellars, Branyan Cellars, Kepnock Cellars, Celebrations and all Dan Murphy's stores across Queensland. You can also come behind the scenes of Kalki Moon, Bargara Brewing Company & Bundaberg Rum on a Bundy Drinks Tour.